CCCIE convened a diverse group of stakeholders in Washington, D.C. in November 2015—including community college administrators and faculty, CBOs, researchers, funders, policy experts, and government officials—to discuss findings from its latest National Survey on Increasing Opportunities for New Americans at Community Colleges and explore the steps colleges and their partners can take to advance college completion, career readiness, and the full integration of immigrant and refugee students into American society. 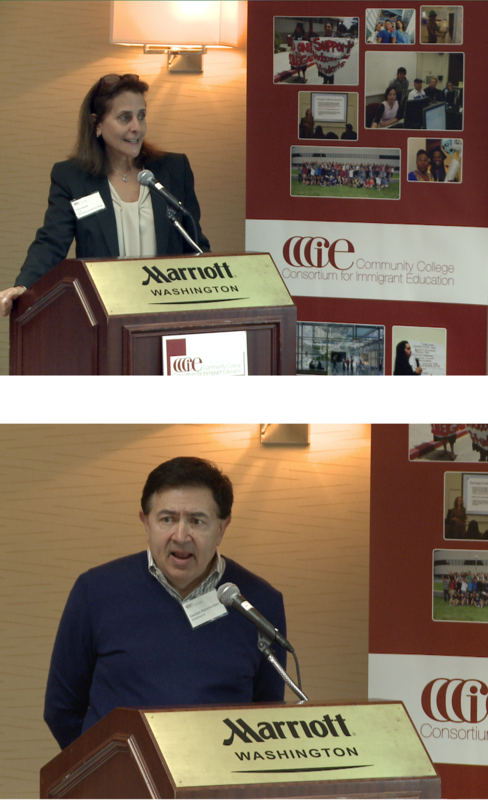 Guatam Ramchandani, CEO of GlobalSource, presented the survey results and Teresita Wisell, CCCIE Executive Director and Vice President, Continuing Education and Workforce Development at Westchester Community College, moderated the panel discussion. CCCIE’s first-of-its-kind national survey, which was launched in March 2015, collected input from 160 community college respondents in 33 states that, taken together, account for well over 80% of the nation’s foreign-born residents. Respondents included a cross section of college staff, including presidents, vice presidents, deans, ESL and other faculty, program directors, as well as staff from workforce development and student services. While more than one-third of the respondents said their colleges include explicit references to support of immigrant students in their strategic or high-level plans, the survey found a wide variability in actual programs implemented on the ground. Read more. The White House welcome was extended by Cecilia Muñoz and Felicia Escobar, both of the White House Domestic Policy Council (DPC), newly-confirmed USCIS Director Leon Rodriguez, and Deputy Director of Homeland Security Alejandro Mayorkas, who reiterated his commitment to promoting integration through naturalization fee reduction — a longtime NPNA priority. The morning plenary session included an overview of the current demographic profile of the immigrant community and a panel discussion exploring best practices in immigrant integration at the federal, state, and local levels and illustrating immigrants’ contributions to building dynamic communities with strong and growing economies. The afternoon breakout sessions provided participants with the opportunity to dig deeper and learn more about immigrant integration initiatives and identify ways the federal government and local communities can work better together to advance a shared vision of strengthening communities for new Americans and all residents. CCCIE’s Executive Director Tere Wisell participated in a discussion that explored ways to expand educational opportunities for immigrants. Erin Howard, Latino Outreach and Student Services Director at Bluegrass Community and Technical College, kicked off the conference, with an introduction on “Kentucky’s Latino and Immigrant Student Success Story: Data, Social Change & Student Empowerment”. Laura Bohorquez, UWD’s DEEP Coordinator and Gaby Baca, BCTC Latina Outreach and a representative of the Kentucky DREAM Coalition, presented on Perspectives on Dreamers and DACA-mented Students, including opportunities to support immigrant students through creation of DREAM friendly spaces, utilizing national and state resources to promote college access and success, and building relationships with local immigrant groups to promote student access and success. Noted Harvard sociologist Dr. Roberto Gonzales, presented (via Skype) on his 10 years of research on the educational experiences and outcomes of immigrant students and shared preliminary findings of the National UnDACAmented Youth Survey. The conference concluded with each college identifying and sharing action steps they will take to improve their programs services. CCCIE looks forward to collaborating with UWD in organizing future DEEP conferences and working together to strengthen community-based resources and partnerships for improving educational access and success for all immigrant students regardless of status. The DREAM Educational Empowerment Program (DEEP), a project of United We Dream, is designed to address the barriers that undocumented immigrant youth face as they pursue higher education. DEEP builds strategically aligned collaborations between United We Dream affiliates, K-12 educators, community college and university representatives, and community-based organizations and leaders to create pipelines to higher education for undocumented youth. CCCIE will be co-hosting this event which will explore: culturally responsive student success strategies, how to create DREAM friendly spaces, ways to use national and state resources to promote college access and success, and building relationships with local immigrant groups. Participants will be encouraged to identify action steps they can take to promote Latino and immigrant student success on their college campuses and in their communities. UWD is planning more DEEP conferences in Texas, Connecticut, New Jersey, and other states as well. For more information on how your community college can become involved, contact Jill at info@cccie.org. CCCIE and IMPRINT were among over 120 organizations invited to last week’s White House Immigration Community Leader Briefing. A highlight of the briefing was the Obama Administration’s decision to grant deferred action to young people brought to this country as children by their parents. This new policy will allow certain undocumented youth to seek temporary relief from deportation and apply for work permits In addition, a variety of immigrant integration issues were covered at the briefing and afternoon workshops including discussions about the important economic contributions of skilled immigrants and immigrant entrepreneurs. Pictured are Jill Casner-Lotto, Director of CCCIE, Paul Feltman of World Education Services, Amanda Bergson-Shilcock of the Welcoming Center for New Pennsylvanians, and Jose Ramon Fernandez-Pena of the Welcome Back Initiative. The free seminar that CCCIE sponsored in collaboration with World Evaluation Services and Northern Virginia Community College at NOVA’s campus on December 10th 2009 was a huge success—and is a model for future CCCIE-WES credentialing workshops at community college campuses. The event, reported in the Community College Times, attracted about 350 students and local residents who turned out to hear how they can apply their education and job experiences to find jobs in the U.S. Nearly a quarter of the residents in the greater Washington, D.C area were born in another country, with almost 40 percent of families speaking another language at home, said NVCC president Robert Templin.